Paul Patterson's masterpiece 'The Fifth Continent ~ A Gift From The Sea' set to the poems of Ben Kaye returns to Romney Marsh on Saturday 9th July with a performance at St. Leonard’s Church, Hythe. Commissioned by JAM in 2004, The Fifth Continent has since been regularly performed all over the UK to both public and critical aclaim. This 'evocative elemental battle between nature and the will of man' has also enjoyed two outings on BBC Radio 3. The work will be perfomed as part of JAM's Choral Extravaganza, starting at 7.30pm (with a 6.45 pre-concert talk by 'The Royal Wedding Composer' Paul Mealor & Paul Patterson). For full details and tickets please call 0800 988 7984 or visit JAM. Following their lauded collaboration ‘Eternal Voices’, the critically-acclaimed Composer Adam Gorb and Librettist Ben Kaye have teamed up once more to write an Opera. ‘Anya17’ relates an original, compelling story of an eastern-European ingénue who leaves her homeland for a new life in the West. Dark undercurrents are soon evident as her decision to forge a new future casts her into a relentless whirlpool of trauma, emotional disintegration and death. Whilst further details of the storyline are currently under wraps, Anya17 is scheduled to be premiered by the Royal Liverpool Philharmonic Orchestra Ensemble 10/10 on March 7th 2012. 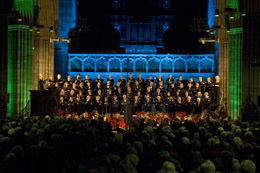 ‘Eternal Voices’ premiered at Exeter Cathedral on Nov 20th 2010 to a capacity crowd and raised over £25,000 for injured service personnel and bereaved families. Eternal Voices was performed by Mezzo Alison Kettlewell, Chorister Guy Fenton, the Exeter Festival Chorus and The Band of Her Majesty's Royal Marines Lympstone. 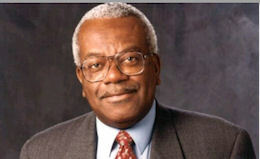 The piece was narrated by Sir Trevor McDonald. Ben Kaye, the work's Librettist commented that "It was a fantastic evening and I particularly valued the time I was able to spend with the bereaved families. The Libretto was the culmination of six months' research and writing so it was fantastic to hear the piece finally burst into life. I know that it was an emotional performance for Adam Gorb too, with a standing ovation forming the perfect finale." 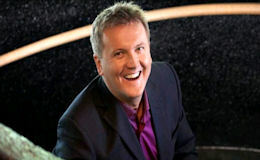 Returning to BBC Radio 3 for a second time, The Fifth Continent will be broadcast in its entirety on Aled Jones’ programme, ‘The Choir’ on March 14th 2010. 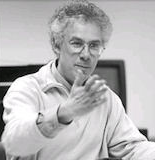 Commissioned in 2004 by JAM, The Fifth Continent was written by the internationally acclaimed Composer Paul Patterson, set to words by the Poet and Librettist Ben Kaye. 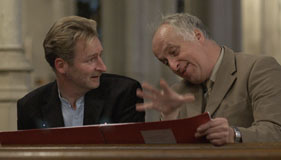 Receiving its premiere at Southwark Cathedral on March 12th 2005, the four movement piece for Countertenor, Organ, SATB Chorus and Brass Quintet was subsequently recorded by the BBC at a performance by the BBC Singers, Andrew Watts, and Onyx Brass on March 17th 2006 at St. Brides, Fleet Street. Conducted by Nicholas Cleobury, The Fifth Continent then went on to become JAM’s most-performed piece in its decade of commissioning new music. At the time of writing, this exploration of Romney Marsh’s many moods has enjoyed a total of nineteen performances and its recording for CD distribution now seems imminent. Adam Gorb and Ben Kaye’s new work ‘Eternal Voices’ will receive its premiere on Nov 20th 2010 at Exeter Cathedral at a special charity concert. To be performed by soloists, The Exeter Festival Chorus and The Band of Her Majesty's Royal Marines Lympstone, the piece will be narrated by Sir Trevor McDonald. The task of both celebrating the return of The Royal Marines from Afghanistan and commemorating the fallen has not been easy for the work’s Librettist, Ben Kaye. The concert will be conducted by Nigel Perrin and Lt Col Nick Grace RM (Principal Director of Music Royal Marines) in aid of the Royal Marines Charitable Trust Fund.